Stretching is an essential part of any physical activity. 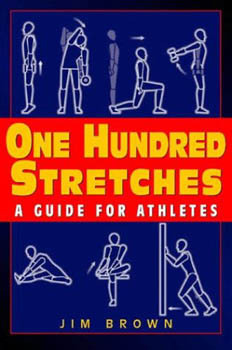 Here sports and fitness expert Jim Brown details one-hundred stretches to help any athlete at any level in any sport. Stretching can improve flexibility, enhance performance, prevent injuries and much more—if done right. From selecting the right stretch (static, ballistic, dynamic, active or passive), to detail on how long to stretch and how often, ONE HUNDRED STRETCHES presents 100 different stretches for every part of the body from feet to head. Also included are sport-specific stretches for running, golf, soccer, swimming and many other sports. Jim Brown is former editor of the Georgia Tech Sports & Performance Newsletter and has written for SI for Women, Better Homes & Gardens, Washington Post and others, and serves on the Wilson Sporting Goods Advisory Staff. His other books include Tennis: Steps to Success.